Western Astrology is the most popular kind of astrology. It’s the main kind of astrology you see in the horoscope forecast pages of the newspapers. Chinese astrology is better known too which depends upon the year you are born. What is least known, but just as important is Celtic astrology. Do you remember what your 2016 Celtic horoscope reading revealed? Do you want to be better prepared for the year 2017? 2018? Understanding these aspects of yourself can prepare you for anything life has to offer. Celtic astrology, also known as your Druid horoscope, has 13 signs instead of 12 signs like the typical western astrology. 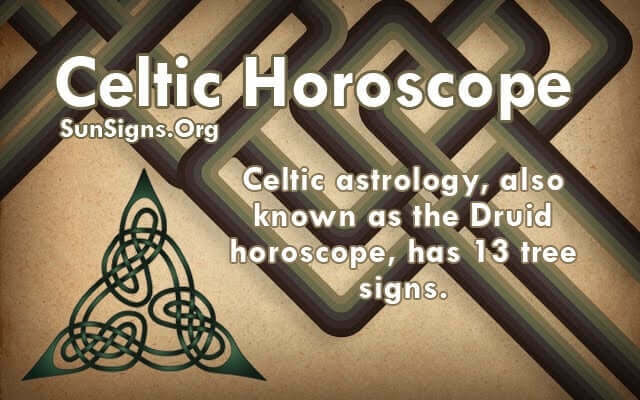 The reason that there are 13 signs is that the Celtic astrology is based on the lunar calendar. There are 13 full moons each year. The signs of a druid horoscope are types of trees. The person born under each tree takes on the characteristics of that tree that have been associated with it. Also each tree is associated with the Ogham which is an ancient Celtic alphabet still used by the wise and few. This will be translated into your lucky letter in terms of the more common English Alphabet. The universe was seen as a tree, to the ancient Celts and for this reason, the 13 Druid horoscopes are each given a tree to be associated with. Your personality is linked to the properties of each given tree. Find out which tree is your Celtic sign with this Celtic sign finder. It could be The Birch, The Rowan, The Ash, The Alder, The Willow, The Hawthorn, The Oak, The Holly, The Hazel, The Vine, The Ivy, The Reed or The Elder. When you get your Celtic reading, you will be able to see not just then name of the tree of your sign, but also the planet that rules over you, your ruling deity, your ruling animal, your Ogham term, your lucky color, your most lucky month of the year, your lucky letters, gemstones, and flowers. A list of famous people in history who have your same Celtic horoscope will also be shown to you. You can wonder just what else you have in common with them! The description of the characteristics of the tree and the wood from the tree reveal much about your hidden personality and what qualities you are best known for. You may be surprised what your date of birth can predict for you with this Celtic Astrology calculator. Your life is yours to discover.